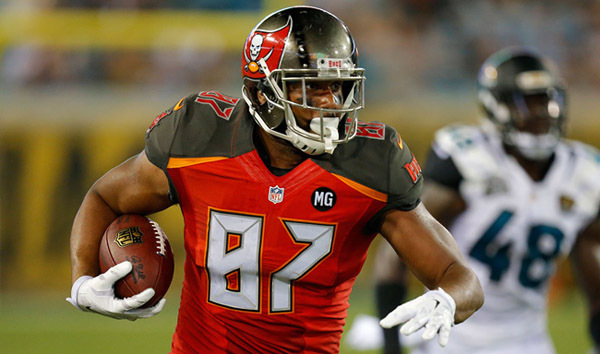 It was a disappointing rookie season for Austin Seferian-Jenkins but the Tampa Bay Buccaneers tight end is hoping to put the woes and injury of his first year in the NFL behind him as he and the franchise are trying to finally move in the right direction. A second round pick in the 2014 draft, Seferian-Jenkins played in just nine games last season, catching 21 passes for 221 yards and two touchdowns. The Buccaneers expected more from the 6’6 tight end out of Washington University, where he had some very dominant seasons. While OTAs don’t always mean something substantial, Seferian-Jenkins has been impressing the coaching staff in practice and workouts so far. The general idea is for him to be a bigger part of the offense with Jameis Winston throwing the ball, if he can stay healthy and not go down every little while. The offense did horribly last season for the Buccaneers, finishing at 2-14 which earned them the number one overall pick in the draft which led to the selection of Jameis Winston. While they had two wide receivers with more than 1000 yards; Vincent Jackson and Mike Evans, the Buccaneers got close to nothing from their tight ends. Seferian-Jenkins was the leading receiver among Tight ends, followed by Brandon Myers with 190 yards and 22 receptions. The Buccaneers are also hoping to get something out of Doug Martin this season, crossing their fingers that his career as a running back who can make an impact isn’t over. That too can help Winston, Seferian-Jenkins and the Buccaneers look a bit smoother and competent offensively.